Hi, everyone. How are you doing? It's very hot in Tokyo, however already September. I'm melting. 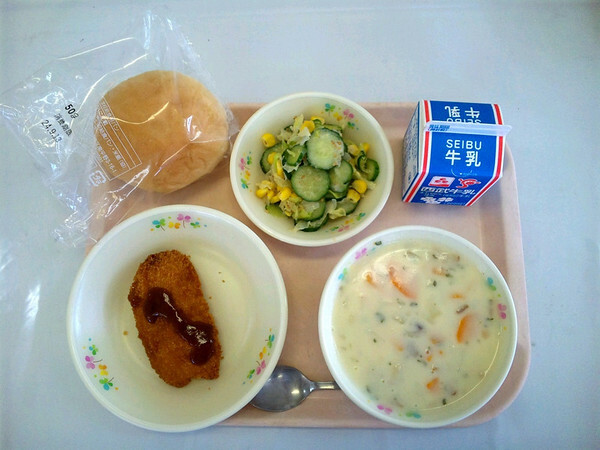 So saying, a school dietician gives me a school lunch photo as a late-summer greeting. Cold Udon Noodle, Tempura, Boiled Vegetable with Miso and Sesame, Cheese Cake and Milk. What a cool summer noodle dish it is! And there is a one more chopped fruits of the Pear as a premium today. The pear is the principal products of this district. The pear is just given annually because it is too expensive for budget of foods. Well. Today I talk about "Local Production for Local Consumption" in Japan. Movement to incorporate into meals the idea of "local production for local consumption" has begun in many parts of school lunch program 10 years before. Incorporated into the school lunch movement to peace of mind, the ingredients of the region, has been steadily expanding. 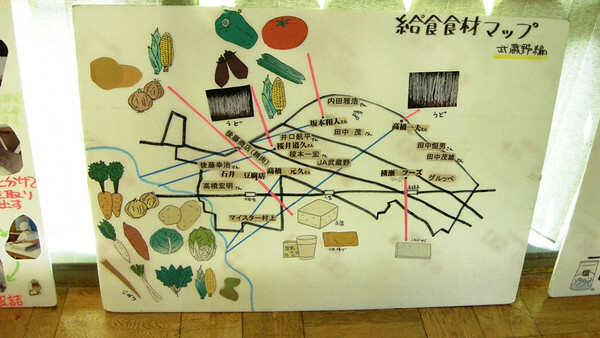 Students plot the growing district of food which is served school meals on Japanese maps. And Students study and plot the local production around the school. Finally, Students found some farmers and report it. Sometimes, Schools invite these framers and suppliers to school lunch time. 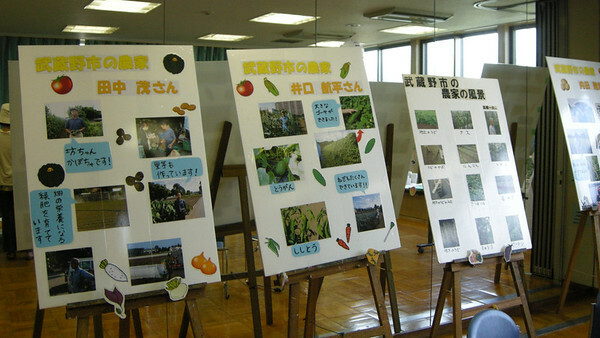 They talk about how to growing vegetables. It is very effective to understand each other. Not only school meals but also local production for local consumption has many benefits for consumers. First of all, can lead producers and consumers in the region will be strengthened. That the so-called "face to face" relationship, also, been verified production situation, we can incorporate into our diet fresh produce. In addition, a better understanding to the "agriculture" and "food", by interaction with consumers and producers, leading to inheritance of regional food culture. It is a very important opportunity for nutrition education, as well as an opportunity to expand the variety of learning. It benefits any producer side the other hand. 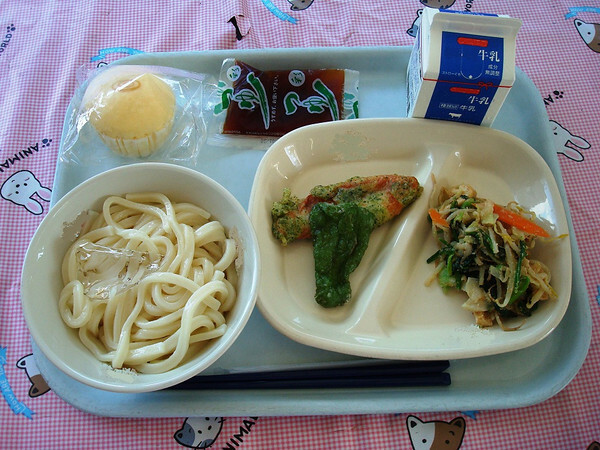 First, it is the ability to expand the supply of domestically produced foods for school lunch there is a demand of approximately 500 billion yen in Japan. In addition, it is possible to ship a fixed amount to client a fixed in advance, as well as packaging materials and labor can be saved, They will also lead to savings in distribution costs. I believed it is possible to deepen the understanding and attachment to the "agriculture" and "food" of local residents and children further. Ms. Josette Sheeran, former Executive Director of WFP had expressed the movement of local production for local consumption in 2010. She said "Japan knows that purchasing food from farmers and making sure children have a good meal to eat at lunch can be a foundation of food security for the nation." In this way, we are pleased that this movement is evaluated and promoted. However, in March 2011, the assessment of the strength of “local production for local consumption” is changed completely. Fukushima nuclear crisis has made all the difference. 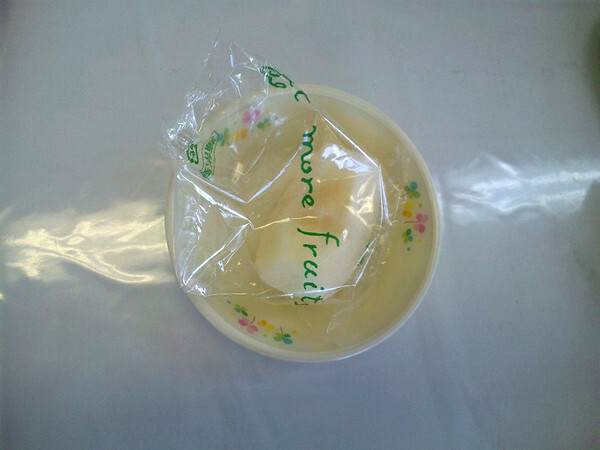 Parents doubt gnaws at food safety in east part of Japan. They are feeling very nervous and reject the local food. Imported ingredients are more safety rather than local grown vegetables. Now, we are facing serious situation for food safety. Now so many municipal governments are testing school meals for radioactive cesium. It is conducted by The Ministry of Education. Nominated school dietician dispatch a sample of whole meals after freezing to the inspection agency. It encourages us a lot. The salad on the lunch meal from Wednesday reminds me of one of my favorite meals. Calabacitas is a dish made from sliced zuchini, sliced yellow squash, corn, green chili, garlic, and onions. Oh, and lots of cheese! Oh,it is Mexican vegetable dish, right? What an interesting post! 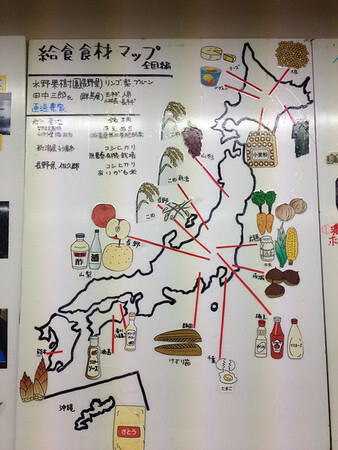 Descriptions of Japanese school dinner system and the dietitians (I would like that job) as well as the sensible approach to food education and effects of nuclear problem on food supply in Japan. And great photos too. Many thanks. PS what is the green food with the tempura in first photo please? Thank you for your message. Arigato gozaimasu. Vegetable which you ask me is a green pepper. Many children hates green peppers in Japan. I think that may be piman- a kind of green pepper. I've noticed that a lot of the time the cooks take a favorite kids food like tempura and use it to serve unpopular foods. Many of my students hate piman with a passion. A very informative post and the lunch looks delicious.